The HYMS iCalendar timetable feed service provides every student and tutor with a personalised iCalendar (or iCal) timetable. This guide explains how to add your personalised timetable to your online Office 365 HYMS email account calendar, from a computer web browser. This guide additionally explains how to add your personalised timetable to your phone (iPhone or iPad and Android). We strongly advise that you regularly refer to your online Office 365 calendar for the most recent information inputted into your timetable. You can also add your timetable to devices such as mobile phones, but we cannot guarantee how often such devices will sync with the timetable. The time taken to refresh the timetable on your mobile device may vary depending on the manufacturer and the available connectivity. Log in to http://webapps.hyms.ac.uk/mytimetable using your HYMS username and password, and copy the ical feed. Add your HYMS email account to your phone; smartphone / tablet apps. 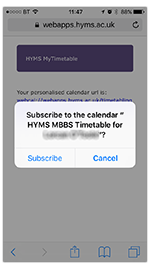 If prompted, choose to also add your HYMS email account calendar to your phone. Click on the iCal feed link. This will add the calendar to your phone. You will be asked to confirm that you wish to subscribe to this calendar. Click on subscribe. 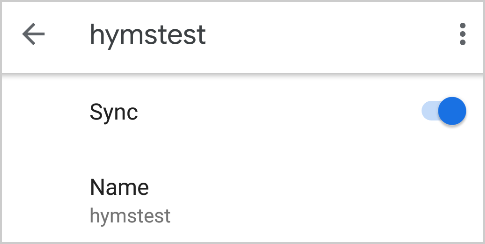 Check your calendar app settings to ensure your HYMS timetable is selected and is syncing regularly. You should now see your HYMS timetable in your phone’s calendar app. 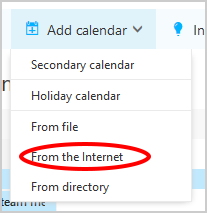 Add your personalised timetable to your online Office 365 HYMS email account calendar, from a computer web browser. See guidance above. 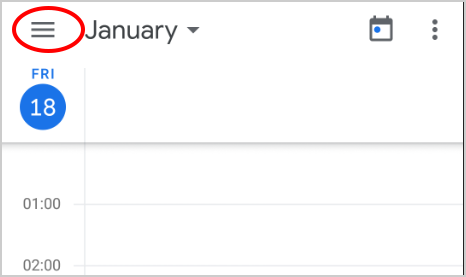 Check your HYMS calendar is selected to be visible (ticked green box in image). 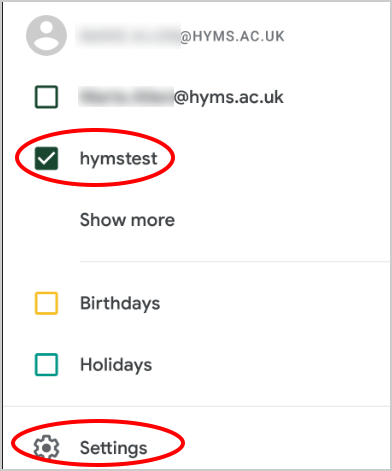 You should now be able to see your phone calendar populate with your HYMS email account calendar information. *Please note these steps and images may vary depending on the phone model.